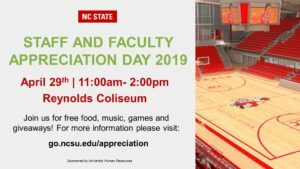 We invite all faculty and staff of NC State University to attend the 2019 Staff and Faculty Appreciation Day in Reynolds Coliseum! 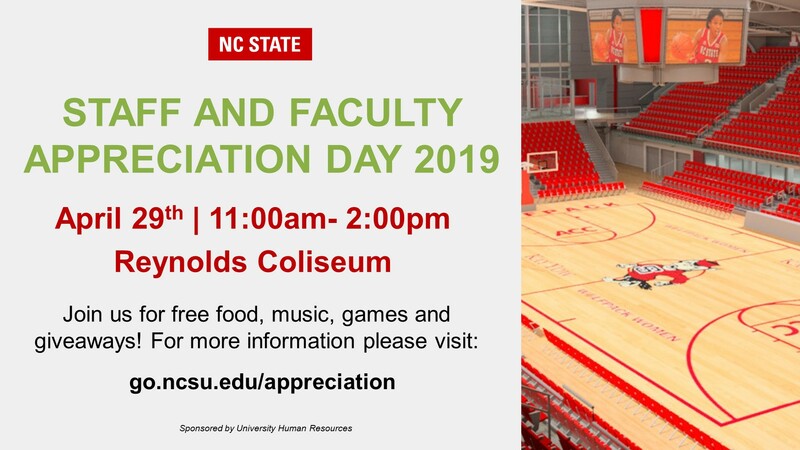 We welcome this opportunity to celebrate all of the wonderful things Staff and Faculty do every day for our University. The event runs from 11:00 AM- 2:00 PM, come enjoy free food, music, games, giveaways and much more! 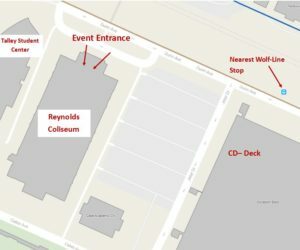 Entrance into the event is along the Dunn Avenue side of Reynolds Coliseum (near the Technology Tower and railroad tracks). For Directions, please visit the Campus Map. If you need special accommodations for the event, contact the Human Resources Benefits Office at (919) 515-2151 (press 2). To provide a safer environment for all guests and in line with similar sporting venues throughout the country, NC State’s Clear Bag Policy will be in place for this event. Bags brought into the venue that do not fit the guidelines of the clear bag policy will be permitted upon inspection by event staff. It is encouraged to comply with the clear bag policy of the venue, however we have alternatives in place so that all staff and faculty can enjoy the event. Carefully consider your transportation options as there is limited parking available surrounding Reynolds Coliseum. Adjacent to Reynolds there is C Parking in the Jeter Drive Parking Bays, as well as limited parking along Cates Avenue and Morrill Drive. The nearby Coliseum Parking Deck is only for those with CD permits. Please reference the Campus Parking Map for more information. Please consider walking or taking the Wolf Line Bus to the event. Visit the Wolf Line site for more information and bus schedules. The Jeter Dr./ Dunn Avenue stop (pictured on above map) is closest to Reynolds Coliseum. Music, Games and Vendors will be located on the historic Kay Yow Court.